When travelling a time difference of six hours or more, travellers need time to adjust to the new time zone. It may be easier to adjust to a time difference of four to six hours compared to when the time difference is more than that. If your trip is not expected to last more than 3 to 4 days, it is better to try to keep the same schedule as at home to avoid overly disrupting circadian rhythms (sleep patterns). Some people may take supplements such as melatonin. 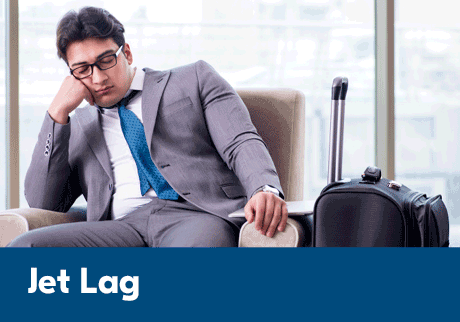 Check with your Pharmacist to discuss ways to deal with jet lag including whether taking melatonin is a safe option for you. When travelling from east to west, stay outside for a few hours in the late afternoon on the day of your arrival and get out early the next morning to enjoy the natural daylight. When travelling from west to east, do not expose yourself to the sun in the late afternoon the day of your arrival, but get up early the next morning.